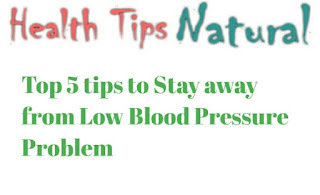 Low or High Blood Pressure both are very dangerous. When blood pressure is less than 120 mm HG and above 80 mm HG. Also you may suffer Dizziness and Nausea. Please consult your doctor first. Try to go to MD. And get blood pressure checked. And follow his advice. Today we will discuss few things through which you can control your blood pressure or you can keep your blood pressure normal. 1. Eat some Salt :- Salt is essential for body. But too much salt is dangerous. It can increase your blood pressure. If you have low blood pressure issue then eat little salt that helps to keep your blood pressure to normal. 2. Drink liquid :- Try to drink more water daily. At least 4 litres every day to keep your blood pressure normal. Note you can drink coconut water and pomegranate juice. This will help to maintain electrolyte. 3. Basil leaves :- Basil leaves are very beneficial for our body. It is easily found every where. We get potassium, magnesium and vitamin C through basil leaves. So try to chew 4 basil leaves daily that will keep your cholesterol low and blood pressure to normal. 4. Stay Away From Heat :- Heat is very bad for those who have low blood pressure issues. You should avoid hot water, sunlight, even bathing with hot water and sitting in a kitchen etc. Try to keep distance from heat. 5. Exercise :- Some exercise or yoga is very essential for body to keep blood pressure normal. Exercise will help to regulate blood pressure.